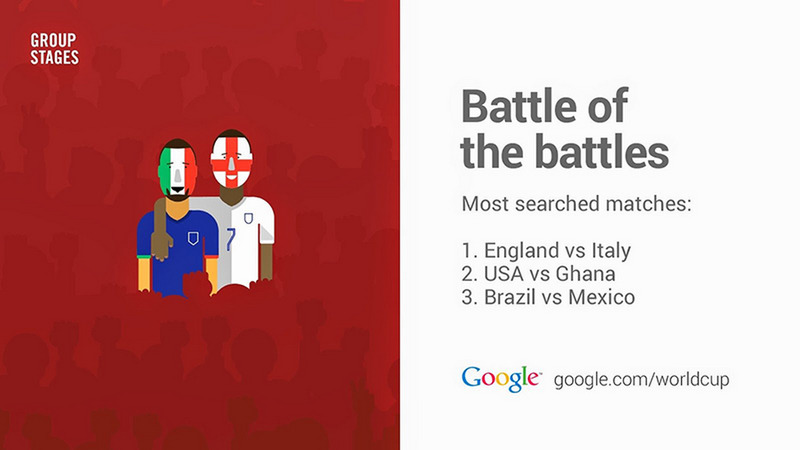 With more than 1.2 billion searches and counting, World Cup fever continues in Brazil and around the world. This week, we’re taking a special look at the top search trends from throughout the tournament so far. 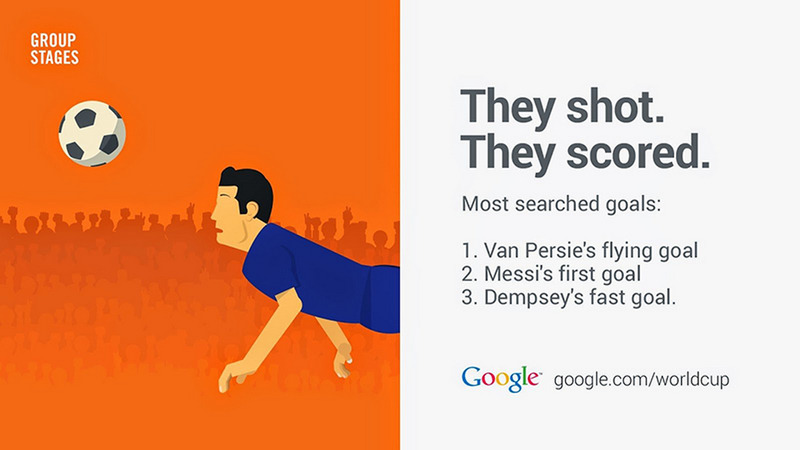 Keep up with all of our insights from search at our World Cup hub. 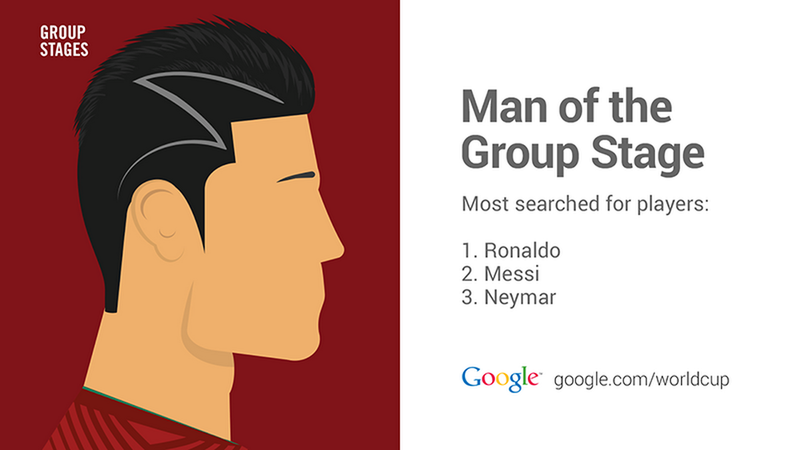 We know Cristiano Ronaldo can strut his stuff on the football pitch—and in the occasional Armani ad—but he’s taking it to new heights on the search charts. Topping longtime rival Lionel Messi and rising icon Neymar, Ronaldo proves all you need to win in search is serious dribbling skills, a chiseled jawline and a unique haircut (although the reason behind his hairstyle may be pretty heartwarming … if true). A World Cup is only as good as its goals—and we’ve seen a couple of doozies this time around. Robin Van Persie’s leaping header made him an overnight Internet sensation, while people were excited to see that Messi got his groove back after scoring his first World Cup goal in eight years. And if you blinked, you might have missed Clint Dempsey’s goal in the U.S.A’s 2-1 victory over Ghana. Clocking in at 32 seconds after the start of the match, Dempsey scored the fastest American goal in World Cup history. That feat, however, couldn’t save the United States as they fell victim to the latest goal in World Cup history off the head of Silvestre Varela. Do you take your fish and chips with pasta? Searchers were eager to watch England and Italy’s clash for Group D dominance (spoiler alert: both teams got the boot) while the U.S.A.’s match against Ghana took second place in search. Rounding out the top three, we’re pretty sure Guillermo Ochoa’s stellar performance and totally convincing impression of a wall was what made the Brazil vs. Mexico match a hot one. 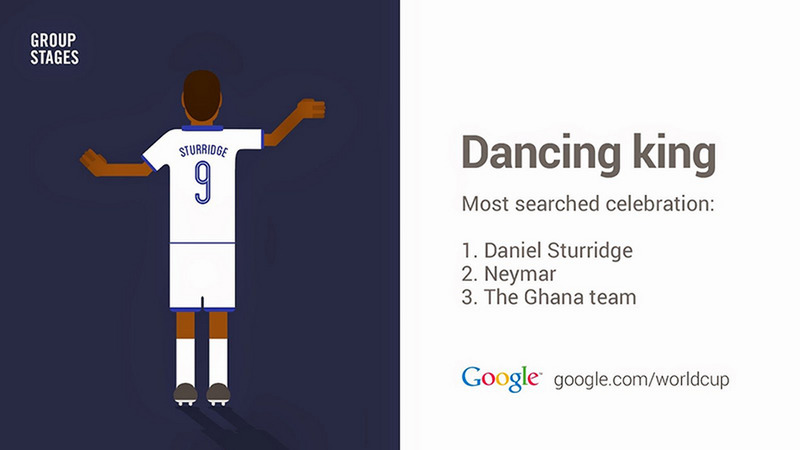 It was a dance-off on the trends charts as Daniel Sturridge's wave won over the crowd ahead of Neymar’s funky jig. But our personal favorite has to be the Ghanaian national team’s collaborative routine after star striker Asamoah Gyan scored a goal to take the lead in their match against Germany. We just love an ensemble! It’s not really about football unless you mention WAGs (“wives and girlfriends” of players). Amongst leading ladies, Colombian singer Shakira steals the search show. And after her partner, Spanish defender Gerard Pique, and his team suffered a World Cup collapse, it just might be a good thing she’s the center of attention.